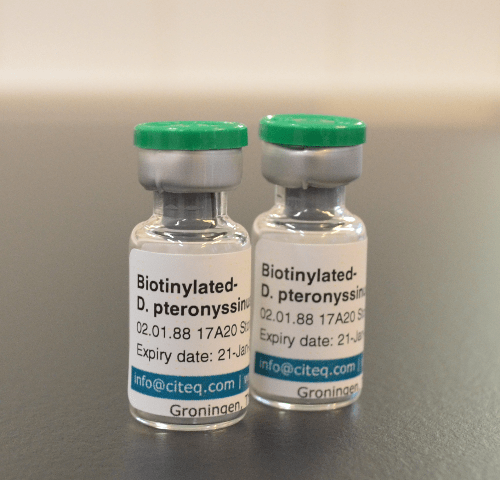 The unique biotinylated D. pteronyssinus (DP) extract was developed especially for research and diagnostic groups. 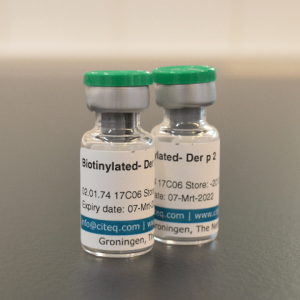 Biotinylated-DP extract can be used to detect specific antibodies in serum of animal models and/ or patients. 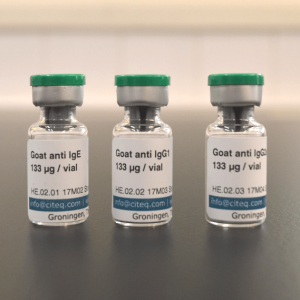 For example, in animal models, with detecting specific D. pteronyssinus antibodies it can be shown that the animal is correctly immunized, or that the animal reacts on the treatment (an in- or decrease of levels of specific antibodies). When in patients the specific DP-antibodies are detected it shows high levels of specific DP-antibodies which indicates that the patient has house dust mite allergy. During biotinylation biotin is attached to macromolecules or proteins. Biotinylated proteins can, due to the high specifity of biotin-avidin interaction, be used to detect and/ or purify proteins. 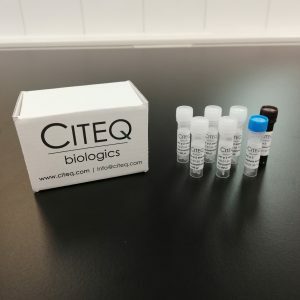 Citeq has developed house dust mite related biotinylated proteins. 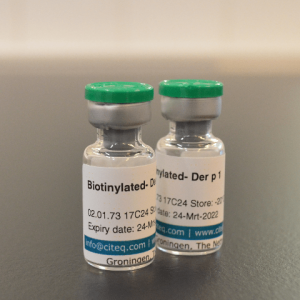 These biotinylated proteins include D. pteronyssinus (HDM) extract and the natural purified Der p 1 protein and Der p 2 protein. Biotinylated proteins can be applicated in many protein assays. These protein assays include for example western blot analysis, fluorescence-activated cell sorting (FACS)/ flow cytometry and enzyme-linked immunosorbant assay (ELISA). One vial of biotinylated HDM extract is sufficient for coating of two 96 Microwell plates. 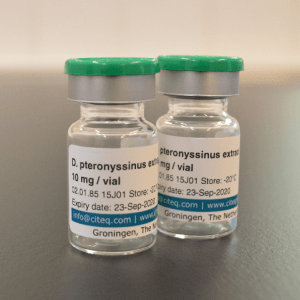 Freeze-dried, our material will be delivered in freeze-dried form (lyophilization) to assure a long shelf life and can easily be used to reach targeted dilutions. No animal or human components, our mites are cultivated on defined media without any animal or human components. On this page you can read more about biotinylation and the protocol for our biotinylated proteins.